DJ-ImageSlider is a free, responsive, mobile ready with touch support extension that can be managed thru component and modules. You can create unlimited groups and slides and put them anywhere on the site. It’s seo optimized, uses CSS3 animations, fast and user friendly backend administration. Each slide can have title and description and link to Joomla article, menu item or URL. cross browser support: IE9+, Firefox 10+, Safari 3+, Chrome 8+, Opera 9+, Camino, Flock 0.7+. DJ-ImageSlider comes with easy backend control panel. There you can manage slides and categories. Listing and adding categories (groups) is as easy as managing core Joomla categories. You can see all your slides, reorder them with drag and drop, and filter by category for easier management. If you select the component as source you can choose the slides category from which slides will be pulled, disable or enable display of title, description, readmore link. You can also define your own text for "readmore", set characters limit for description and decide if title and description should also be links. 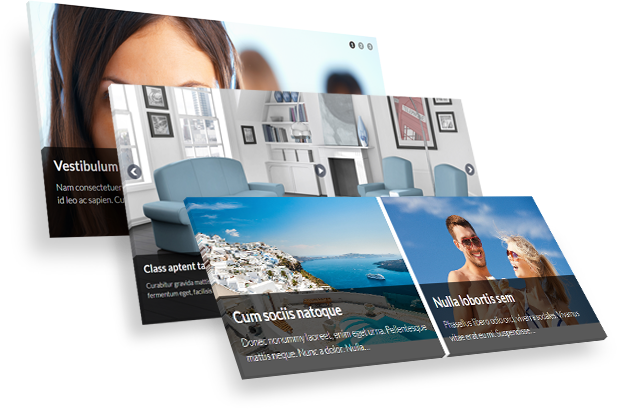 - set the amount of images visible in one slide! It's also easy to position the navigation horizontally and vertically. Additionally you can choose if the indicator will be bullets or numbers. Tune your effects choosing exact effect and effect type.